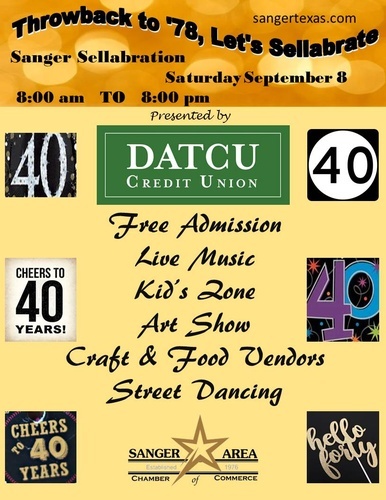 Our town’s Chamber of Commerce is hosting their 40th Annual Sellabration on Saturday, September 8, 2018 from 8:00 am to 8:00 pm, which is the highlight of the Sanger Community. Historically, over 5,000 people have attended this festival. The festivities include live music; vendors; kid’s zone; numerous stage performances; Little Miss & Mr. Sanger Pageant; street-dancing and a variety of festival foods all in a street-fair atmosphere. There is no entry fee and it is definitely family-friendly. So come on out and join us in Historic Downtown Sanger located at Bolivar and 5th Streets.